Island chefs give us some new ideas for the big day. Just about 52 years ago, the Green Bay Packers set out to play the Kansas City Chiefs in America’s very first Super Bowl. At $12 a ticket, this was the first and only Super Bowl in American history to not sell out. A local high school marching band took the stage for the halftime show, and meatballs with grape jelly or pigs in a blanket were among some of our nation’s most popular snacks. This was a simpler time; things have changed. The Super Bowl has evolved into being a representation of American culture and all that we love — sports, performance, advertising, and food. If you love at least one of those things, chances are you are one of the millions of viewers (statistically enough make up almost half of America’s population) that plans to sit down this Sunday with a bag of Tostitos in hand, ready to watch the Pats win. Yes, I did knock on wood as I wrote that. Whether it’s the game or getting to yell at your TV for a few hours, which is really America’s favorite pastime, Super Bowl Sunday is a holiday for all of us. 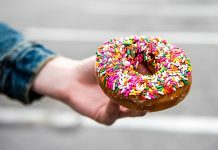 It is reportedly the second largest day for food consumption in the U.S., just behind Thanksgiving. This is where I come in. I grew up just as every New England girl should, with belief in the Father, the Son, and the holy Tom Brady. I am being facetious, of course. You can find me in a Patriots jersey each Sunday, though, but I am most likely located in the kitchen, because that is a place that has always made more sense to me than a football field. We are now living in a time where tickets to the Super Bowl are $3,000 and more, and the halftime show is taken over by multimillion-dollar superstars who dominate the music scene. 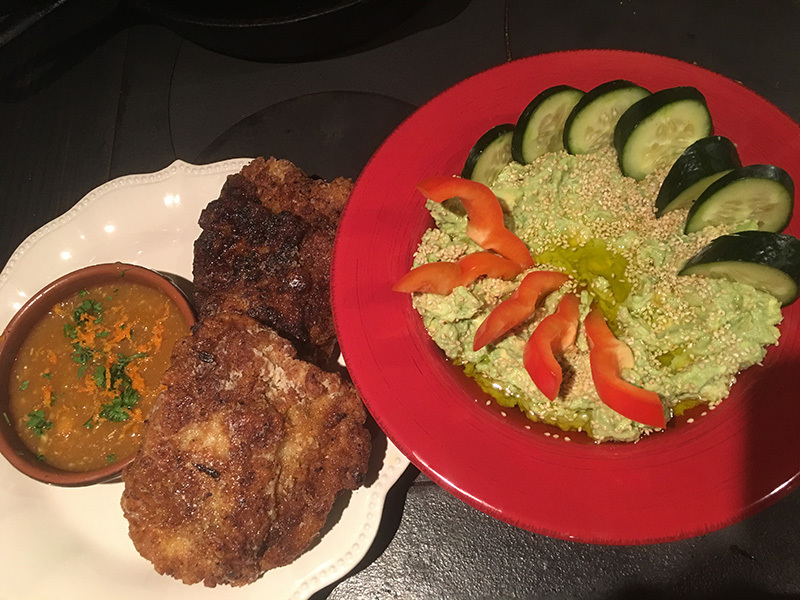 So I thought I would reach out to a few of those who dominate our Island’s culinary scene for some Super Bowl snack recipes. A few of Martha’s Vineyard’s most talented chefs have contributed recipes and tips, so this Sunday we can try some new things before we indulge in the sweet taste of victory. Go Pats! Chef Carolyn King spends her summers in command of the Edgartown Yacht Club kitchen, and is approaching her 18th season here on the Vineyard. She spends her winters all over the map, soaking up information to influence her repertoire. 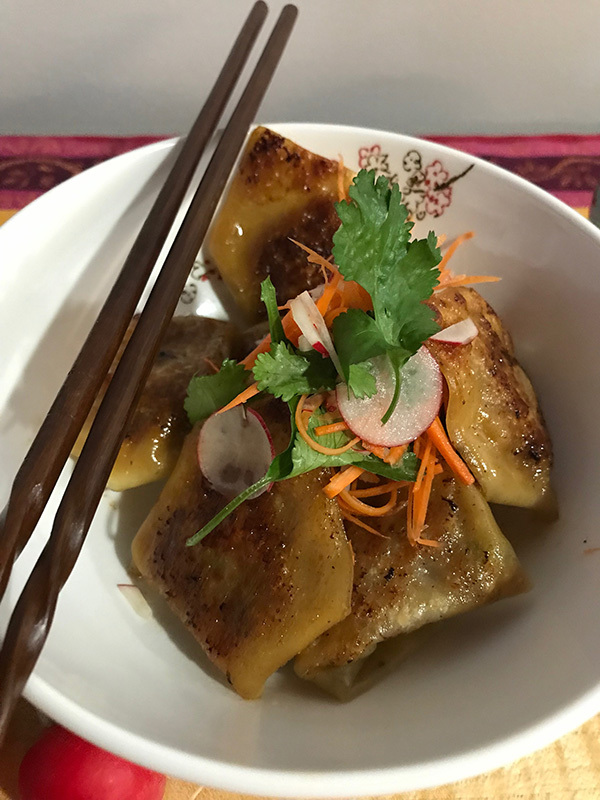 She most recently has been working on some of her own internationally influenced snacks, so she thought a little Asian flair might be just what our Super Bowl smorgasbords might need. Combine raw meat, squeezed cabbage, ginger, garlic, scallions, sesame oil, sriracha chili sauce, and 2 tablespoons soy sauce in a bowl. Lay a wrapper on a clean, dry surface, brush egg along half of wrapper. Place a rounded teaspoon of filling in center, fold over and seal by pinching edges together. Brush outside with egg, and fold wings into center of dumpling. Cover potstickers with wrap until ready to cook or freeze, for up to three weeks. To cook, put about 2 tablespoons oil in a large nonstick skillet and turn heat to medium-high. Add potstickers, one at a time. Cook about 2 minutes, or until bottoms are lightly browned. Add ½ cup chicken stock per dozen dumplings to pan, and cover. Lower heat to medium, and let simmer about 3 minutes, until pork is cooked through. To make the dipping sauce, combine remaining soy sauce and ¼ cup vinegar. Uncover dumplings, return heat to medium-high and cook another minute, until bottoms are dark brown and crisp and stock evaporates. For the slaw, shave carrot and radish thinly, toss with cilantro leaves and a splash of rice wine vinegar. Serve hot with sauce, and garnish with slaw. .
From Farm Neck to the Sweet Life Cafe, to Garde East and more, Carlos Montoya has graced the finest kitchens around the Vineyard for the past 10 years. 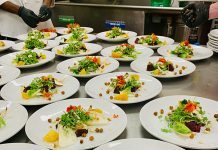 His culinary influence comes from his classical French training, with Asian-Latin fusion, to Italian to Mediterranean, and contemporary American practice. Over the years he has developed relationships with local farmers, fishermen, and other Islanders responsible for bringing us the best of what the Island has to offer. 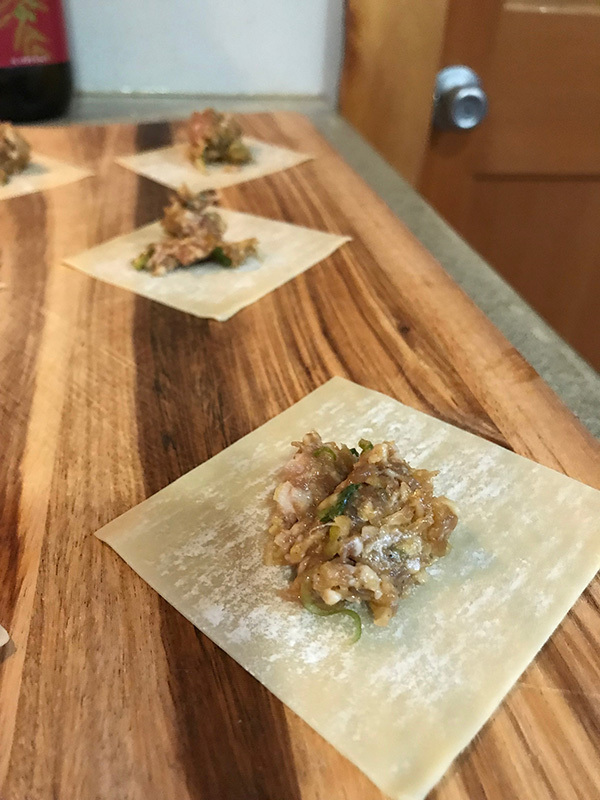 This, he says, allows him to showcase the “amazing bounty of the Island.” With just a few ingredients and easy execution, this seafood-inspired snack embodies local flavors, and high-level cuisine. Season salmon and sole with salt, pepper, and ground ginger. Place salmon and sole into 2 separate baking dishes, split the wine and butter between each. Cook the salmon for 12 minutes, skin side down, and cook sole for 8 minutes. Allow fish to rest and cool to room temperature. Remove salmon skin, and flake both fish into a big mixing bowl, and set aside in refrigerator. Wash and scrub potatoes. Quarter potatoes with skin still on. Place potatoes in a pot with cold water, bring to a boil, and then reduce to a simmer. Cook potatoes until tender. Remove from water and allow to cool at room temperature. Once cooled, mash potatoes with a fork. Combine potatoes with flaked fish and the rest of the ingredients. Gently combine all ingredients until mixed well. Cover and chill for 30 minutes. Shape into 3-ounce cakes. Dust cakes with flour lightly on both sides. Heat large sauté pan over medium heat with enough olive oil to coat the pan. 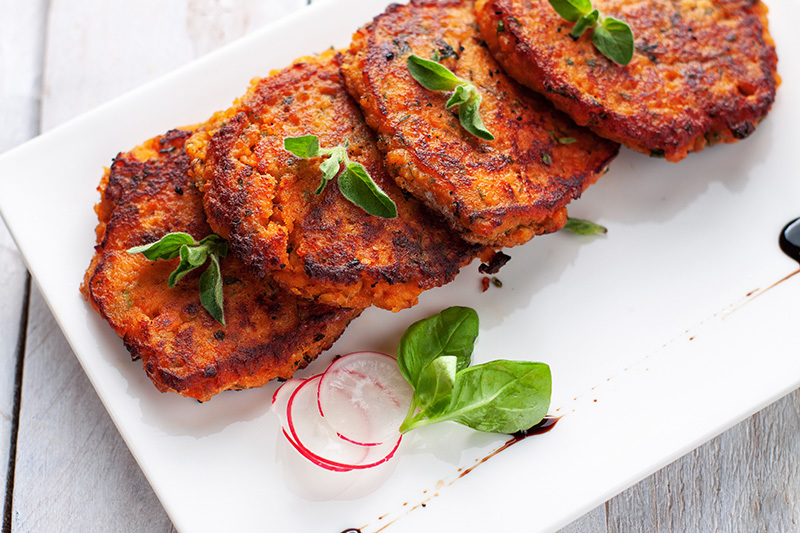 In batches, add cakes without overcrowding the pan, and pan-fry for 3 to 4 minutes on each side until browned. Drain on paper towels. Keep them warm in preheated 250° oven, and serve hot with tartar sauce or your favorite mayonnaise-based sauce. 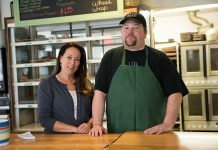 “I always think of the Super Bowl as nosh day, which translates to lots of snacks,” says Jan Buhrman, who prospers in the Vineyard food scene with her locally based catering business, Kitchen Porch. Like me, Jan finds herself with a much greater love for food than sports, but she says the Super Bowl is one of the rare occasions that she believes it’s necessary to eat while keeping the TV on for the game. 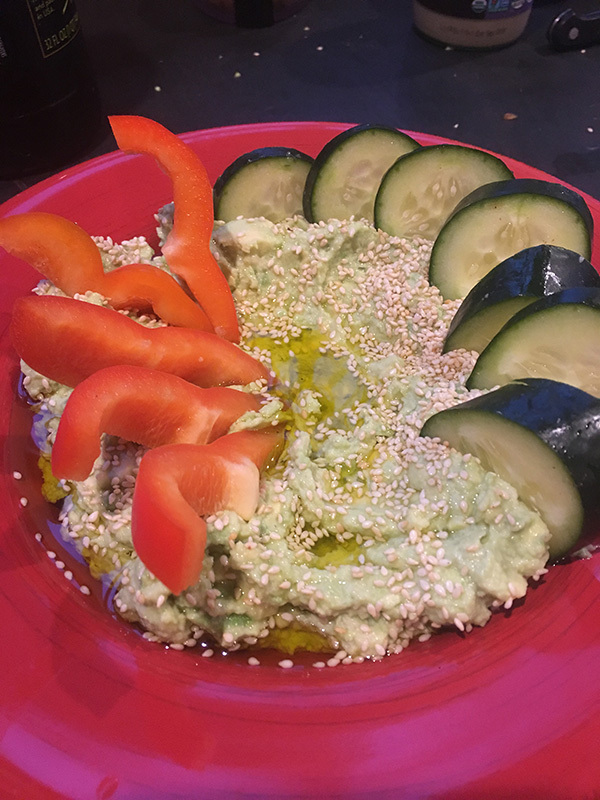 With the mantra of creating tasty meals for challenging diets, Jan decided to bring some fresh vegetables and gluten-free crunch to this Super Bowl food collection. Scoop the avocado into a medium bowl and mash with a fork until well blended. Add the tahini, salt, garlic, and lemon juice and blend to combine well. Taste and adjust seasonings as needed. Transfer the mixture to a serving bowl. Drizzle with olive oil and sprinkle with sesame seeds. Serve immediately. To cook the eggplant, a grill is the easiest way to char the outside, and makes scooping the inside out simpler. Cook, turning with tongs, until eggplants are tender and well charred on all sides, 30 to 40 minutes. Wrap with foil and let rest 15 minutes. If using the broiler, adjust rack to 5 to 6 inches below broiler, and broil on high. Cut eggplants in half, and char the skin side by placing the eggplants on a foil-lined sheet pan. Broil until charred and tender, about 20 minutes. Allow to rest in broiler with flame turned off. Eggplants should be very tender when cooked. Once cooked, scoop out soft flesh with a spoon and put in a strainer, and discard any charred skin. Allow to drain for 30 minutes. Toss all the liquid. Note: You can do this step by hand or in a food processor. Place eggplant in bowl. Add garlic and lemon juice to eggplant, and stir vigorously with a fork until eggplant is smooth. Add tahini, and olive oil in a thin, steady stream, and blend well. Stir in parsley and season to taste with salt, plus more lemon juice if desired. Put in a serving bowl, drizzle with olive oil, and serve with pita bread or vegetables for dipping. Baba ganoush can be stored in the refrigerator for up to four days. Allow it to warm to room temperature before serving.